In a speech that lasted over 45 minutes, Clinton covered a wide variety of ground, speaking on the economy, health care, the American justice system, international trade and immigration. Clinton also spoke about the contrast he sees between his wife’s campaign and that of Trump, though he rarely actually used the GOP nominee’s name, instead calling him “her opponent” or alluding to policies Trump has proposed or ideas he’s advocated throughout his campaign. 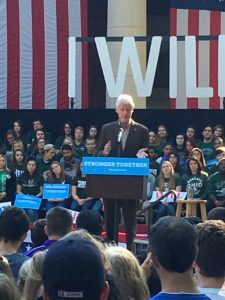 While Bill Clinton’s speech at times focused heavily on policy, his message to the predominately college-aged crowd was the importance of their votes in the 2016 election. In fact, on the rafters filled with students behind Clinton’s podium was a large sign promising, “I will vote,” and campaign volunteers were stationed around College Green registering voters. Introducing Clinton was OU freshman Bailey Williams, an Ohio Together Organizer who said he had supported U.S. Sen. Bernie Sanders in the Democratic Primary but is now excited to cast his ballot for Hillary Clinton. Sanders won the majority of Democratic primary votes over Clinton in Athens County. 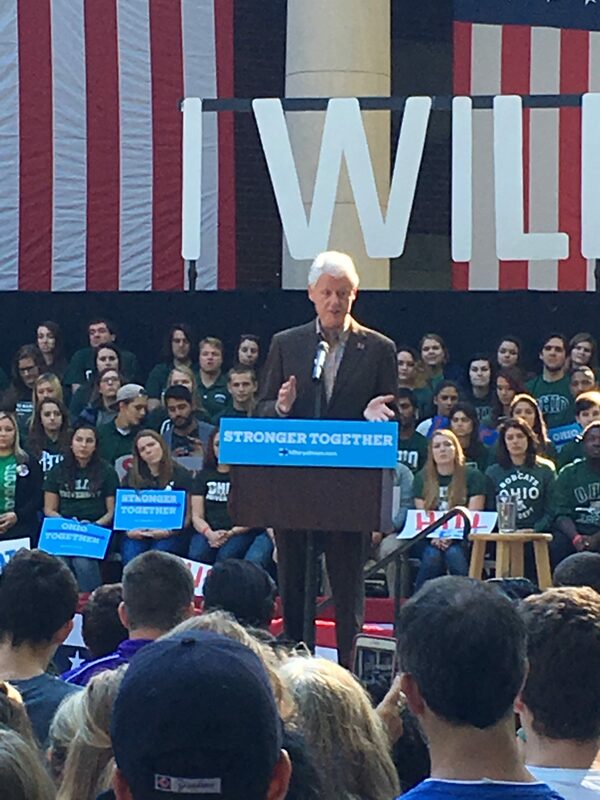 Williams said he could provide a million reasons to vote against Trump but added he is voting affirmatively for Clinton because of her plans to look out for middle-class families and make college affordable. Bill Clinton echoed those sentiments in his own speech, saying that at the Democratic National Convention in July Sanders and Hillary Clinton took their two plans for college affordability and combined them to make something even better. In contrast to Trump, Clinton said his wife “actually has a plan” on that issue and a variety of others whereas her opponent does not. “Look, that’s like me saying I’d like to be 20 again. Fifty years ago that’s what I was. I actually would like to be 20 again… but I would not vote for somebody who promised to make me 20 again,” he said. It was the second time Clinton interacted with an audience member. About five minutes into his speech, an activist began loudly reading a statement to Clinton. Clinton returned to the subject nearly a half-hour later in his speech, after delineating a variety of Hillary Clinton’s proposals on education and health care. “If you do all this, we still have to figure out how we’re going to live together,” he said. He said too many people are serving too long in prison for non-violent offenses. He said Hillary Clinton wants to invest in education and training, and to “ban the box” on employment applications that requires applicants to reveal if they’ve been convicted of a felony. Clinton also said America needs police reform, to end the private prison industry, and to increase mental-health and addiction treatment. He said America also needs good police officers to protect citizens, referring to community policing techniques where officers know and interact with people in neighborhoods. Clinton also returned to his theme of optimism and positivity, especially with regard to young people participating in the election. Clinton said that he was raised to believe that Americans should share the future and that everyone who is working hard and trying should be treated with dignity.